Unlocking Land Law will help you grasp the main concepts of the subject with ease. 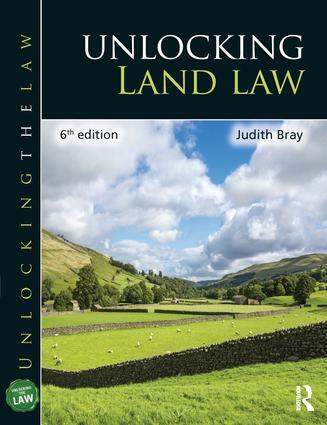 Containing accessible explanations in clear and precise terms that are easy to understand, it provides an excellent foundation for learning and revising land law. glossary of legal terms clarifies important definitions. This edition has been extensively rewritten and updated to include discussion of recent changes and developments within the module. These include the decision in Marr v Collie  UKPC 17 and its implications on implied trusts and rights in the family home; Regency Villas Title Ltd v Diamond Resorts  EWCA Civ 238, which has reviewed the definition of an easement; Smith v Molyneux  UKPC 35, which revisits the law on consent to a licence in adverse possession cases, and, not least, the interesting decision in Baker v Craggs  EWCA 1126, which considers what constitutes a legal estate in land under s 2 Law of Property Act 1925.